Box no. 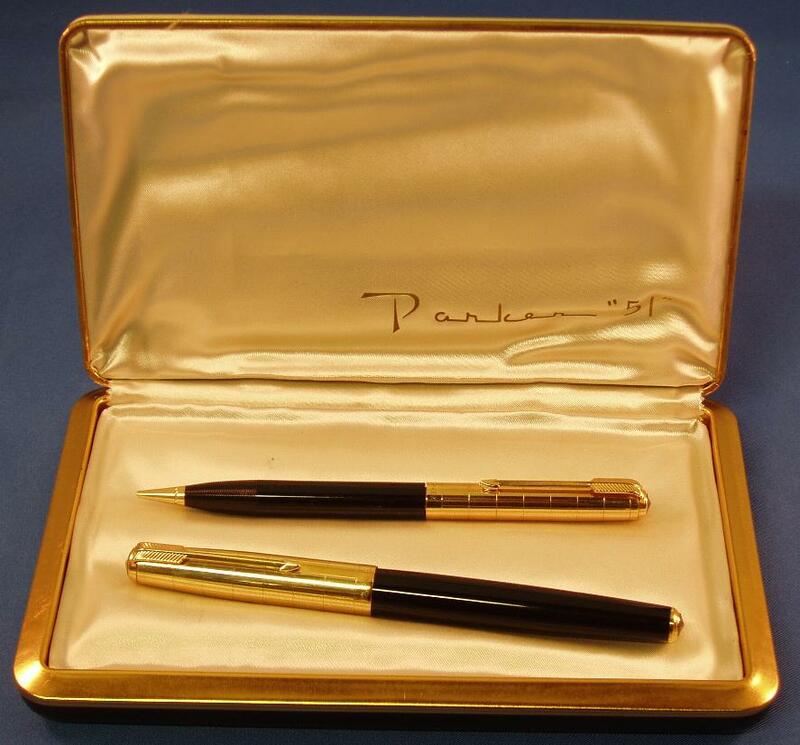 260 Made in U.S.A.
One of the more luxurious and attractive boxes made for the Parker “51”. High quality. 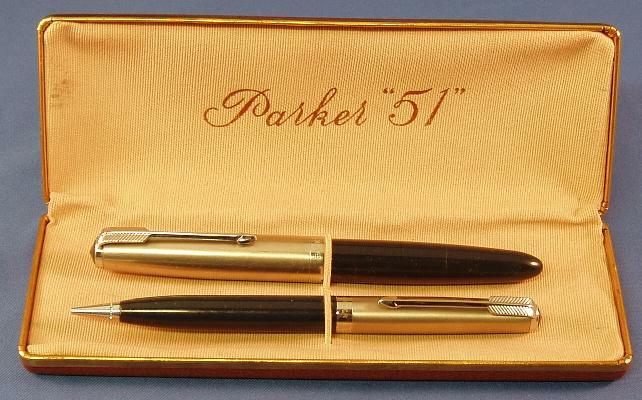 Used at the end of the vacumatic series and the very beginning of the aerometric series, although most of the time it is found with 1947 or 1948 transition clip vacumatic “51s”. This box came with a New Old Stock Heritage (window pane) set dated 1947. 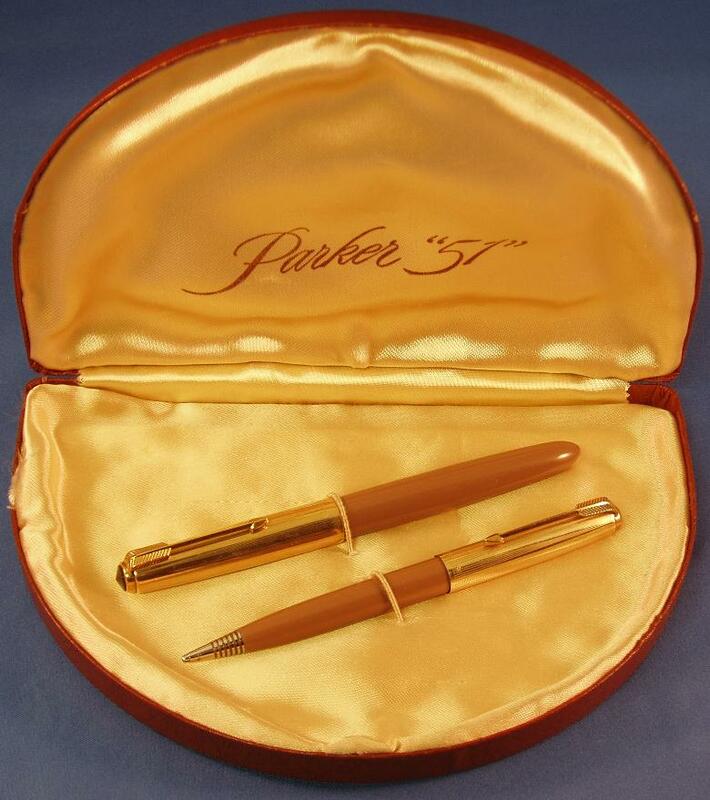 A circa 1948 box, similar to the Flighter and Signet boxes of the era, but in white. Very unusual. 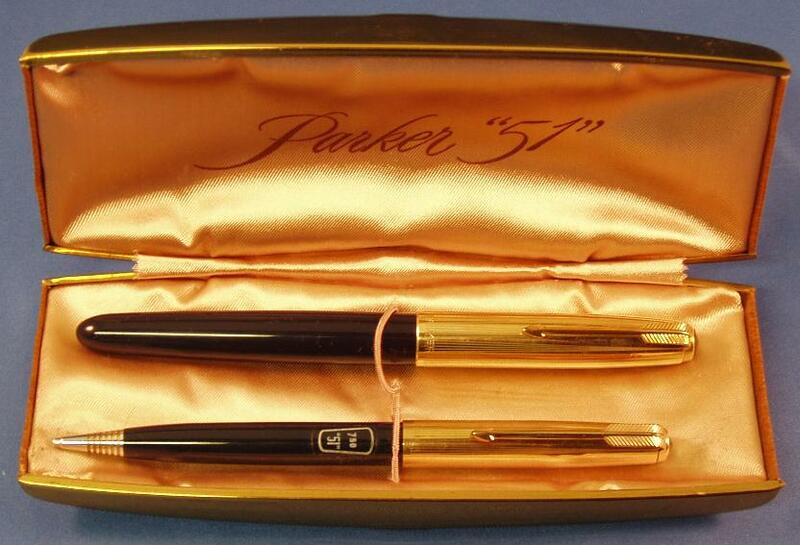 This box was found with a 1947 dated Heirloom vacumatic “51” series set. 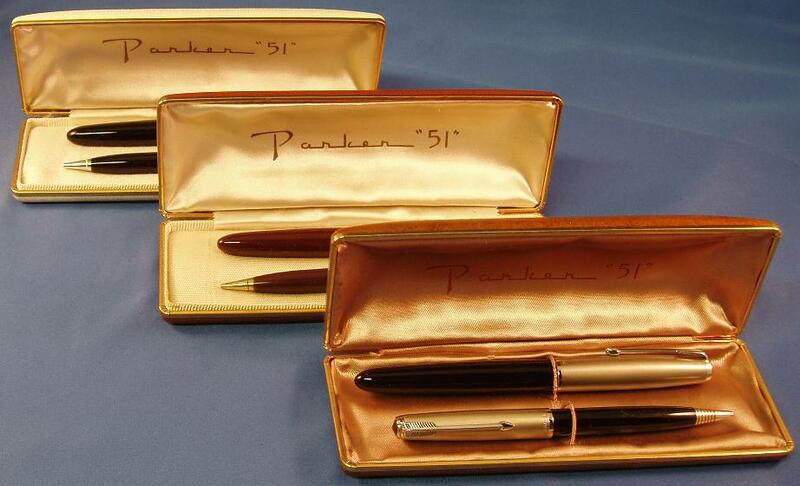 Box no 258 Made in U.S.A.
A trio of boxes, all with the same number but different finishes inside and out. Most of these boxes seem to be used for the Demi vacs of 1947 and 1948, also one also finds some of the early aerometric demis in this box. 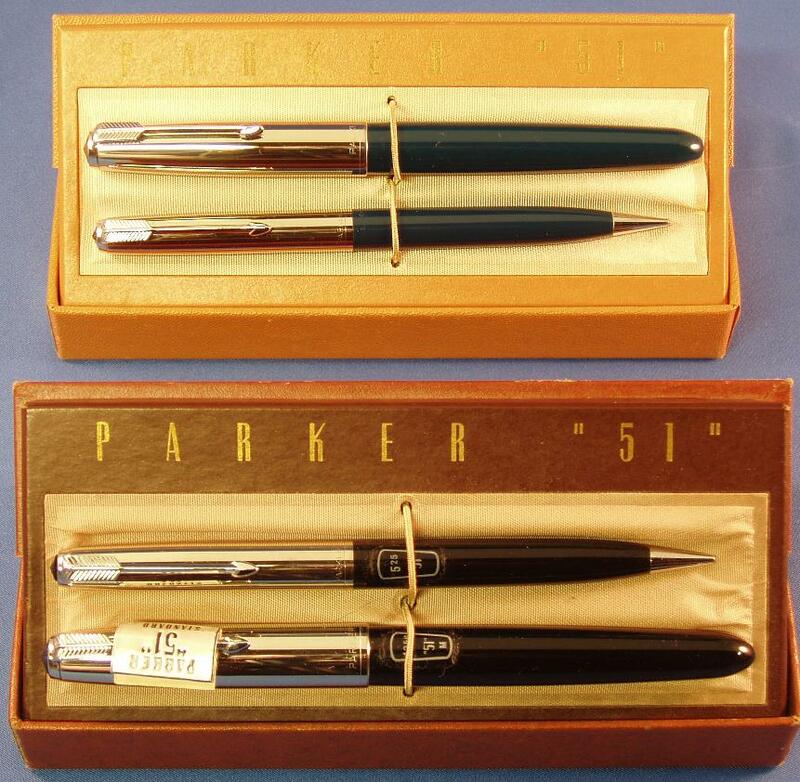 Box no 244-B Made in U.S.A.
Large box similar to the first year high end boxes, but with “Parker 51” in script. 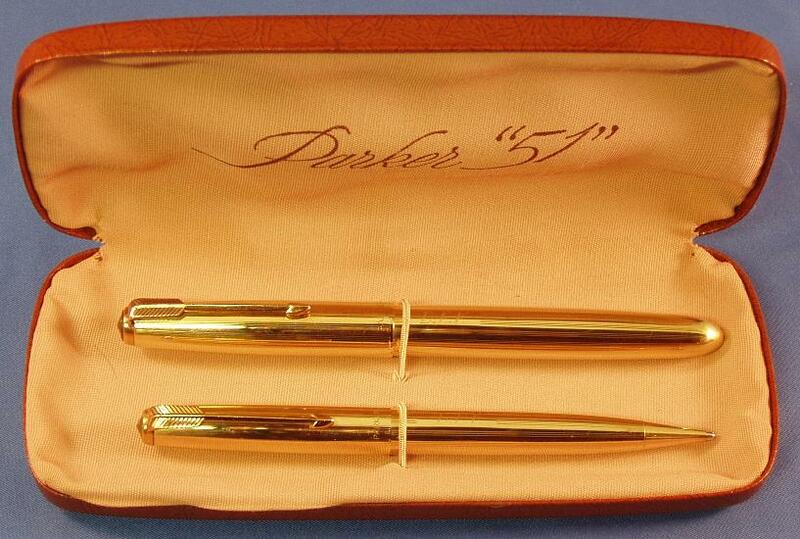 Most often used with the early Signet sets. 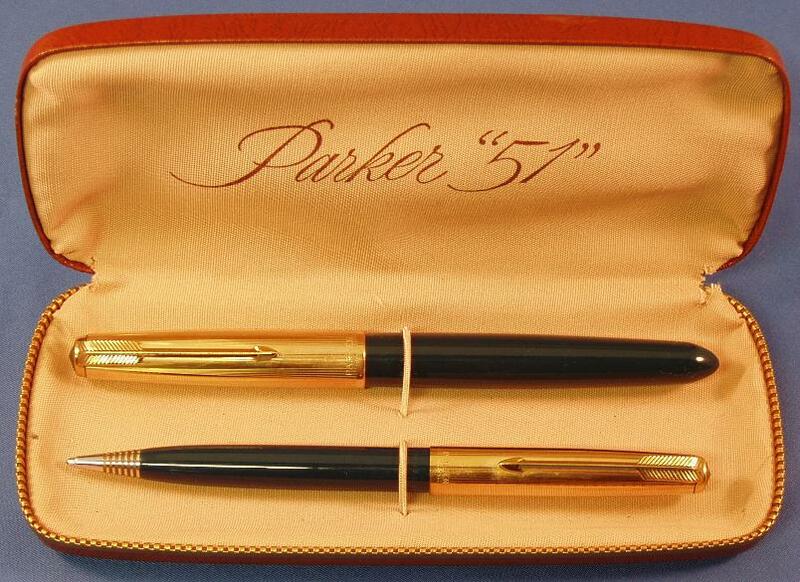 In this case, the set found in this box is a 1947 vacumatic series set with the unique pattern Signet caps. 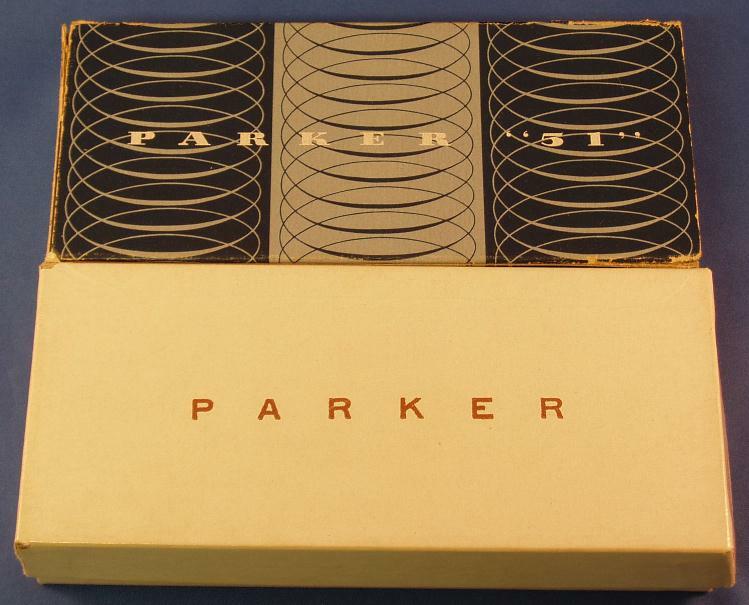 Box no 244 Made in U.S.A.
Large box similar to the first year high end boxes, but with “Parker 51” in script and blue lining. Decoration on the outside of the box is in silver. 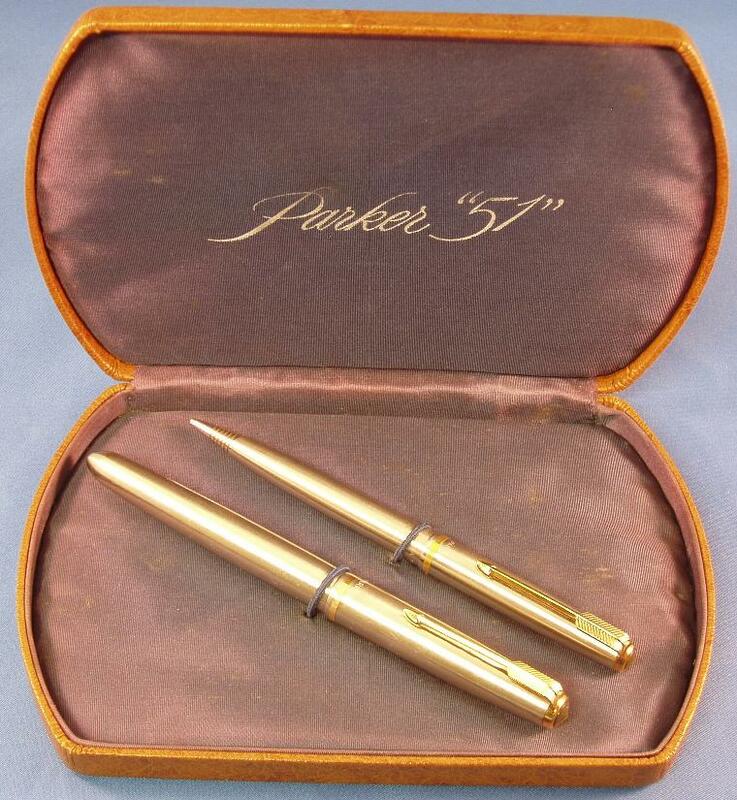 Most often used with the early Flighter sets. 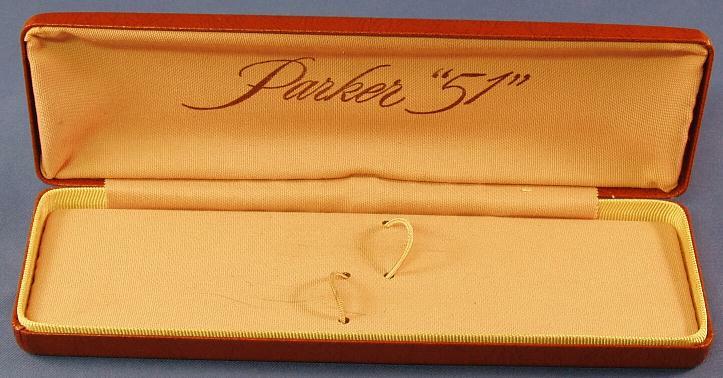 In this case, the set found in this box is a 1949 set. Box used in the 1948-1950 period for the full size and demi size aerometric sets. Identical boxes marked Made in U.S.A. and Made in Canada. Box for aerometric sets circa 1951 to 1953. 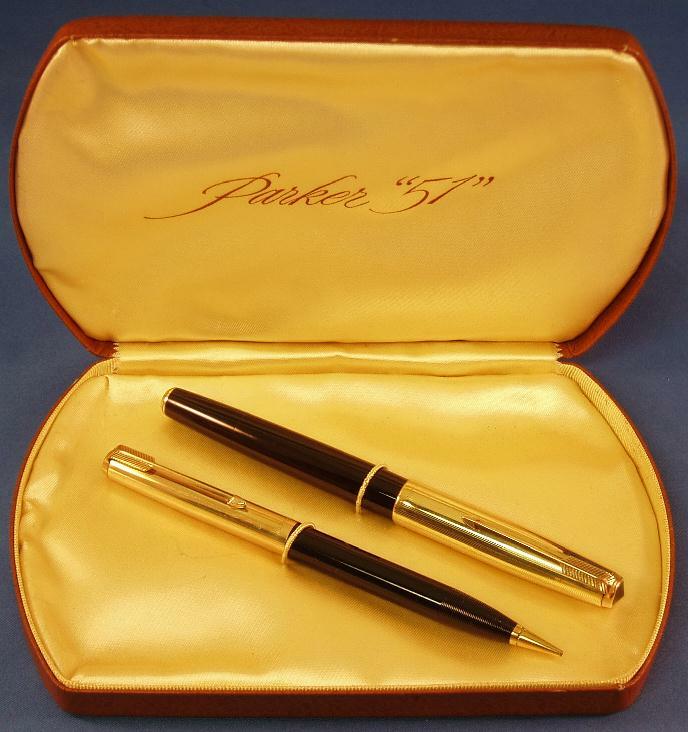 Two versions available – one metal “51” one top and the other with “51” engraved in gold. Bottom – Box No. 270-M Made in U.S.A. Box for aerometric sets circa 1951 to 1953. Same as box No. 270, except no gold “teeth” edging on lower lip. 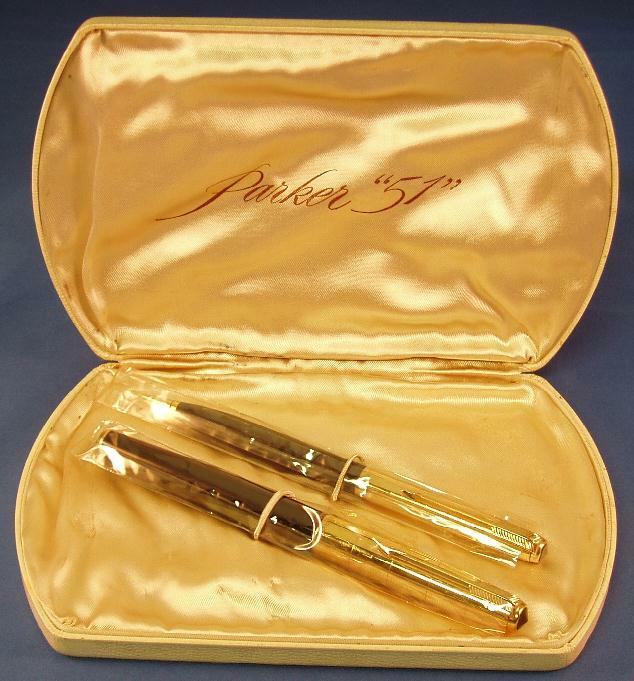 “51” engraved in gold on top. A very unique box, half-moon design, similar outside and inside finish to the Signet Box no. 244-B. This box came out of Canada with a Cocoa Demi set dated 1949. It does not have a box number or country of origin. Cardboard boxes in two different finishes, ca. 1953. Usually found with the lower end “Special 51” sets. Box No. 263 Made in U.S.A.